Welcome to Bangladesh Cricket. This blog is maintained by Khondaker Mirazur Rahman who is working as editor of www.banglacricket.com and Bangladesh Editor of www.cricketworld.com. Consistent failures from positions of strength, where does the problem lie? Bangladesh will start the most important year of their cricket history with a tri-series featuring India and Sri Lanka. Bangladesh enjoyed a successful 2009 and bagged overseas Test and ODI series wins against a weakened West Indies and successive ODI series wins against Zimbabwe, their favorite opponent in international cricket. Tigers will now have a great opportunity to see where they stand when they face the more threatening opponents in India or Sri Lanka at the Tri-series ODI tournament starting on 4th January 2010. Bangladesh also started their 2009 cricket calendar with a tri-series involving Sri Lanka and went on to the final only to lose out at the hands of batsman Muralitharan after defeating the same opponents at the group stage. The third team was Zimbabwe who stayed on for the first of the three ODI series played between these two teams in 2009. This time Bangladesh must raise their game for a similar result as Zimbabwe has been replaced by India who easily overpowered Sri Lanka in several recently concluded high scoring encounters. For a change, India will stay on after the tri-series for a 2-match Test series, their first one after becoming the top-ranked nation in the longer format of the game. Bangladesh rattled a hapless Zimbabwe and a weakened West Indies in 2009 under the much praised leadership of Shakib-Al- Hasan. Shakib admirably raised his game after being forced to step-in after the injury of newly appointed skipper Mashrafe Mortaza. Bangladesh initially named Mashrafe captain for the tri-series and the Test series which follows, but had to revert to Shakib-Al-Hasan due to the fitness concern of Mashrafe. This last minute change gives Shakib the opportunity to continue his good work with the team he led for most part of 2009. Bangladesh recovered well after the sudden ICL shock when some of their leading players deserted the national team for the more lucrative but unsanctioned Indian Cricket League. While the experienced ICL bound players were in the middle of a losing streak, the new breed of players who replaced them transformed the luck of the Tigers and won matches against teams like New Zealand, Sri Lanka and West Indies. The ICL storm has recently died down and Bangladesh players have cut their ties with the league and they are up for selection after serving a six month cooling down period as suggested by ICC. However, there is no surprise that Bangladesh coach Jamie Siddons, who faced a very difficult challenge with the new breed, is reluctant to make any major changes and wants to keep faith in his boys who have time and again showed their talent and determination, and have won matches at the top level of cricket. Bangladesh cricket is going through a rebuilding phase and it is far from a finished product. They do not have the luxury of being able to ignore the ICL recruits and a couple of them, Aftab Ahmed and Shahriar Nafees, is already making a strong case for their inclusion into the playing XI for the up-coming series. The Bangladesh selectors have included them in the 15-man squad which sends a strong positive signal to the resumption of the international careers of other promising ICL mercenaries like Alok Kapali and Mosharraf Rubel. Shakib Al Hasan led Bangladesh to ODI and Test series victories in 2009, Bangladesh will expect the same in 2010. Despite making giant strides in the recent Test and ODI series against West Indies, Bangladesh are languishing in top-order batting and also in the pace bowling department. Bangladesh’s success in the tri-series will heavily depend on how these two inconsistent departments perform on any given day. Since their inception into the cricket elite, Bangladesh’s struggle in the top order batting has been ardous. Bangladesh has tested more than 20 opening pairs in the last five years and could not yet settle on a single pair! The latest pair of Tamim Iqbal and Zunaed Siddique came to a premature end after the regular failures of Zunaed Siddique. Zunaed had enjoyed the backing of the coach but lost the support of the selectors. Bangladesh has included the in-form opener Imrul Kayes in place of Zunaed, but he will face stiff competition from Shahriar Nafees who has also returned to the national fold. Shahriar Nafees looks to be set for a return as an opener and if he can utilize his experience and rectify his past mistakes, he and Tamim Iqbal can forge a solid opening partnership for Bangladesh in both Tests and ODIs. Aftab is one of the hardest hitter of the cricket ball in Bangladesh and he can be an asset during power play overs. But, just like Ashraful, he lacks maturity and often throws his wicket recklessly after a good start. He has expressed his determination to amend his past mistakes and become a permanent fixture of Bangladesh after a 15-month lay-off from international cricket. If Aftab’s words are transformed into action on the field, Bangladesh can expect better days in the upcoming Tri-nation ODI series. The pace bowling department of the current Bangladesh team lacks direction in the absence of leading pacer Mashrafe Mortaza. Shahadat Hossain has lost his venom and is currently out of favor. In the absence of these two frontline bowlers, the return of Syed Rasel from injury is the only consolation for Bangladesh. He is likely to share the new ball with Nazmul Hossain who has made significant improvements over the past 12 months. 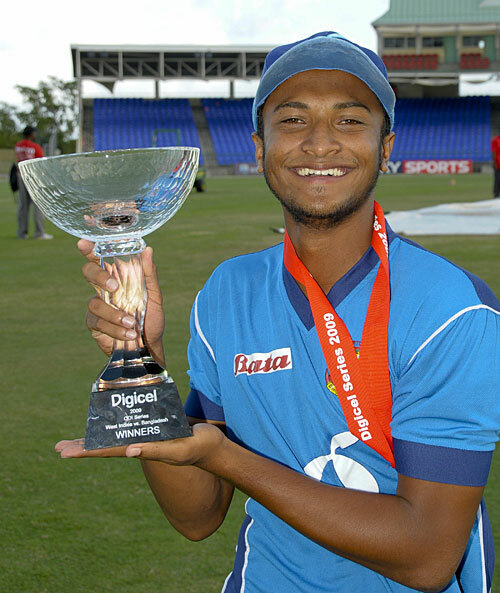 As part of an on-going tradition to include a rookie pacer in every other series, Shafiul Islam has earned national call after leading the bowlers tally in the domestic limited overs competition. He will face stern tests against power hitters from India and Sri Lanka. The Bangladesh team management must handle this promising pacer with care and support him for a reasonable period of time. Bangladesh’s strength lies in their middle order batting and spin bowling department. A middle order consisting Shakib Al Hasan, Mushfiqur Rahim, Mahmudullah and Naeem Islam is comparable to that of India and Sri Lanka and they have routinely rescued Bangladesh after the almost religiously regular shaky starts by the top order. Bangladesh has arguably the best spin attack of the competition. In addition to the world leading SLA duo of Shakib and Razzak, Bangladesh have variations in tidy off-spinners Mahmudullah and Naeem Islam. Mohammad Ashraful is another useful spin bowler who has repeatedly come to the assistance of his captain to break partnerships. Bangladesh can expect at least 35 overs of uncluttered spin action to tie up the opposition batsmen on helpful Mirpur conditions. It will be difficult for Bangladesh to reach the final of the tri-series which features two of the most explosive one day teams of modern cricket. Sehwag-Gambhir-Yuvraj of India and Dilshan-Tharanga-Sangakkara of Sri Lanka can tear away the opposition on their day. Bangladesh’s initial target should be to go after Sri Lanka who will field a relatively inexperienced side due to the injury of key players. In that respect, the opening match against Sri Lanka on January 4 may become the most important fixture for Bangladesh. Bangladesh has not played a team ranked above them since January of 2009. The leap from playing Zimbabwe to playing India will be a big one. Bangladesh is expected to compete and make the opponents fight to beat them. If the big boys slip up a little, then the Tigers will pounce on them and can win games. If Bangladesh can build their momentum early-on, Shakib-Al-Hasan led team has the potential to break new grounds in the Tri-nation ODIs which they have regularly done in 2009 albeit against weaker opponents. The same script, the same fate and with every repetition, Bangladesh falls further behind in international cricket. Once again we see the scene of a “bewildered” Mohammad Ashraful looking at his non-striking partner in disbelief and finally trudging back to the pavilion cursing his fate for yet another idiotic dismissal at a crucial moment. His cavalier attitude towards cricket has been a detrimental influence on a youthful Bangladesh side that follow more often than not their skipper in playing reckless cricket. This is how Mohammad Ashraful is leading Bangladesh. And this is why a team with immense potential is consistently failing to compete at the top level. Ashraful’s lack of insight and understanding of the state of the play is not only affecting his own batting, but also the way Bangladesh approaches a game as a batting unit. A player who has been playing international cricket for 8 years should realize his problem. Yet, Ashraful shows no sign of learning. He simply does not seem to know the art of building an innings. And taking responsibility is not a virtue which is present in his book. His reliance on luck by playing risky shots in the air and not trying to minimize the “luck factor” is sending a wrong signal to his young teammates. Ashraful’s dicey approach has started to become the trademark style of Bangladesh batsmen. They are not developing the character and determination required to succeed in international cricket. It is time to realize the simple fact that audacious stroke play, over-ambitious and reckless cricket won’t take them anywhere in the near future other than bring even more humiliations for them and their 150 million passionate cricket followers. Reliance on “once in a blue moon” Ashraful is causing more harm than good to the prospect of Bangladesh as a cricket team. In Jamie Siddons, Bangladesh has a coach who believes in long term Tigers uprising at the expense of short term “flash in the pan” successes. In Champaka Ramanayeke, they have a capable bowling coach who has effectively turned a mediocre Bangladesh attack into a competitive one within a very short span of time. However, the good works of the bowlers are getting consistently nullified by incompetent “reckless” batting. What is the weakest link in Bangladesh cricket that is holding the Tigers back in International cricket? On-field captaincy. Having vision, the ability to motivate others, possessing self-knowledge and leading from the front are the essential characteristics of any leader. Unfortunately for Bangladesh, Mohammad Ashraful’s antics during the last 8 in international cricket show that either he doesn’t understand or is completely unaware about the attributes of a captain. His recent dismissals against Sri Lanka in the second Test and in the opening match of the tri-series against Zimbabwe should be the final nail in his captaincy coffin. Bangladesh needs someone with a more serene and assured approach to inspire a youthful side. It is time Bangladesh cricket administrators understand this reality and take appropriate actions. Bangladesh already has replacements who can step up to take the responsibility like they have done at age group levels. Shakib Al Hasan and Mushfiqur Rahim are two such names. Mashrafe Mortaza’s susceptibility to injury virtually rules him out of the running; otherwise he would have been a serious contender for the position. Both Shakib Al Hasan and Mushfiqur Rahim came through a proper cricket system in which they represented age group, academy and A teams. Both of them have the experience of captaincy at different levels and led their respective teams with examples. They are young but have proven leadership qualities. Most importantly, they have calm heads on their shoulder and rely more on substance than flashy style. The recent stance by the ECB to not invite Bangladesh after 2010 will definitely influence the minds of other cricket administrators who might want to follow the suit. Bangladesh has apparently failed to learn the basic tenets of Test cricket even after 8 years of introduction to the top league and aren’t consistent enough even in ODI cricket. Bangladesh’s recent form in international cricket is very much alarming for the overall future of cricket in the country. The current team management has failed to build on the achievements of the previous team management in one day cricket. When every other team is making strides we are walking backwards. And the skipper is leading the retreat with his fanciful game plan. However, not everything is lost. Bangladesh has showed some encouraging signs in recent home Tests and fought neck and neck against South Africa and New Zealand. They have managed to take the honors in a couple of sessions. But, there is a huge difference between winning a couple of sessions of a Test match and winning the match itself. This is where a true leader can make a difference. On every occasion where Bangladesh had achieved winnable positions in Test cricket, they have been denied by inspired leadership from the opposing captain. This happened in Multan (Inzamam-Ul Haque), Fatullah (Ricky Ponting), Mirpur (Graeme Smith) and Chittagong (Daniel Vettori). Bangladesh needs a leader with the same combination of skill, vision and insight to lead them out of the current morass. It is not that Bangladesh aren’t trying to improve their game. The question is whether they are taking the right approach to be competitive at top level cricket and whether the right leadership is in place to take a young team forward! When a socially and economically ruined country like Zimbabwe, with its dysfunctional cricket structure, starts beating Bangladesh comfortably, then something is very wrong. Immediate action is required before irreparable damage is done. It is always said that Bangladesh must learn to play cricket within their limitations. To compete at the top, they must buckle down and put a high price on their wickets. We have seen no concrete signs of this happening in recent years. Only a true leader can make this happen. A change in leadership has never been more required than now! Time is running out for Bangladesh especially in Test cricket. With every Test series defeat, the media whispers are getting louder and louder and piling up further pressure on the underperforming Tigers. Bangladesh did not help their cause either by letting the opposition off the hook whenever they had achieved winnable positions and ultimately notching up another mark on the Test defeat column. The recent stance by the ECB to not invite Bangladesh after 2010 will definitely bring Bangladesh’s Test performance against Sri Lanka under the microscope of other cricket administrators who might want to follow the suit. Bangladesh showed some signs of encouragement in recent home Tests and fought neck and neck against South Africa and New Zealand. They even took first innings leads against both oppositions. This in of itself is a rarity considering Bangladesh’s poor record in Test cricket. However, there is a huge difference in winning a couple of sessions of a Test match to winning the match itself. Bangladesh can only blame themselves for this current mess as they have apparently failed to learn the basics of tenets Test cricket even after 8 years of introduction to the top league. Bangladesh must learn to play cricket within their limitations. They must buckle down and put a high price on their wickets to compete at the top. Audacious stroke play, over-ambitious approach and reckless cricket won’t take them anywhere in the near future other than bring even more humiliations for them and their 150 million passionate cricket followers. Bangladesh’s lack of self-belief and leadership, both on and off the field, are two main reasons why a team with immense potential is consistently failing to compete at the top level. Inconsistent Mohammad Ashraful is failing to lead with example and Bangladesh needs someone with a more serene and assured approach to inspire a youthful side. It is time Bangladesh cricket administrators understand the reality and take appropriate actions. His undeniable talents cannot hide his continuous run of poor shows and inexplicable idiocy at crucial moments of play. Let him earn his place in the team and let him fight to retaining it. It has been seen that the notion of honor and responsibility associated with the captaincy has not changed Ashraful; perhaps only the fear for survival might affect a change. His casual approach towards cricket has been a detrimental influence on a youthful Bangladesh side and whatever happens in the Sri Lanka series; BCB must not get fooled by his antics and must put an end to his captaincy for his own sake. Sri Lanka is not an unfamiliar opposition for Bangladesh. This will be their second visit to Bangladesh. On the first occasion in 2006, Bangladesh had their moments in both Test matches and won one of the three ODIs. This time a lot more is expected from the hosts after three years of international experience. Sri Lanka is coming after an un-satisfactory series win over Zimbabwe and haven’t had any Test cricket for the last five months. Bangladesh must learn to capitalize on these potential weaknesses and put pressure on them from the first morning of the first Test match. Batting will again hold the key for Bangladesh and playing Muralitharan will be the main challenge for the top order batsmen. Every top team in international cricket has one or two special bowlers and negotiating them well is often the deciding factor between a win and a loss. Bangladesh has played 10 Test matches against Muralitharan and they should learn by now the way to counter him. If they can exorcise the Murali ghost, they should be able to cope with the rest of Sri Lankan bowling line up that is missing the likes of Ajantha Mendis and Lasith Malinga. Bangladesh has its own problems in bowling. In 2008, the pace bowling duo Mashrafe Mortaza and Shahadat Hossain looked as threatening as a paper Tiger and as effective as a placebo. Someone from the coaching staff should tell Shahadat Hossain that he must stop pretending to be a fearsome fast bowler and his barrage of short pitched deliveries are not any more effective than his grunts in distracting opposition batsmen. The grunt might cause some annoyance, but his gentle medium half-trackers cost valuable runs for Bangladesh. A less adventurous and level headed approach won’t do any harm to the prospect of Bangladesh in the Test series. Recently, Shakib Al Hasan has stepped up to fill the void left by Mohammad Rafique and established himself as the premier spinner of Bangladesh. ICC suspension on Abdur Razzak has opened the door for Enamul Haque Jnr. and if he can grab the opportunity with some performances, Bangladesh might be able to restrict the out of form Sri Lankan line up within manageable scores. Bangladesh’s coach Jamie Siddons has pledged a long term Tigers uprising at the expense of short term “flash in the pan” successes. Despite the recent ICL exodus, he managed to retain his core group of players. Now, it is high time for Bangladesh to transform his pledge into solid performances on the field. No more excuses please! Bangladesh desperately needs a win under its belt to justify its inclusion in to the elite league. This two match Test series against Sri Lanka is the first available opportunity for the Tigers to achieve the feat. J amie Siddons took charge of Bangladesh with expectations, from fans and pundit alike, at a sky high. Here was a young team that had knocked out of the game’s super powers in the 1st round of the world cup, slain one of the WC semi-finalists in the 2nd round and then followed up with some exhilarating, stroke-play filled performances in the Twenty 20. Taking helm of the side was one of the architects of the Australian juggernaut: their batting coach, himself an accomplished batsman and rated higher than Steve Waugh by a certain Shane Warne. Team full of inconsistent but naturally gifted batsmen being run by a batting guru - what could go wrong? The results so far have been mixed. No major victories to speak of, a few abject performances, some good totals and a few centuries. The bubble of expectations having been rudely burst, fans and media have been clamoring for answers. Jamie Siddons was kind enough to provide BanglaCricket’s own Mirazur Rahman his take on things. BanglaCricket(BC): What was your motivation for taking charge of the Bangladesh team? Jamie Siddons (JS): I took the position as it was an amazing opportunity to coach an international cricket team, and it was a natural progression from my position as assistant coach of Australia, where we had won the World Cup, The Champions Trophy and regained the Ashes. I wanted to bring my knowledge and experience to Bangladesh and take them forward. BC: In terms of cricketing ability where does Bangladesh stand now? JS: It is not a question of cricket ability but a question of cricket schooling, where you learn the art of playing cricket. Coaches, competition, and facilities are some of the things that are just not preparing our players for the tough world of international cricket. Our players are as skillful but we are lacking the depth of consistent performers at the highest level of cricket. BC: You have said you are trying to change the cricket culture of Bangladesh and also the way the players approach their game. Can you elaborate? JS: We have no player in our side that you could say are truly successful international cricketers. This was so before I came on board. We love them (current players) and they are our heroes but they do not have results or statistics that their oppositions have. Our batsmen average in the 20s while our opposition batsmen average 45 - 50. Our bowlers average 45; opposition bowlers average 25. This suggested to me that things, and team culture is one of them, needed to change. Accordingly I have taken a long term approach even if I may not be around as coach to see the results of my work. The players are learning to train and prepare in a more professional and responsible manner, where we are trying to improve so that we can be consistently competitive, not just when all the stars are aligned and we have a “good day”. We have several players in the team at the moment who I believe have the ability to lead from the front and be world class players; players whom we can count on each time we play. This is what I am excited about for Bangladesh Cricket and our supporters! BC: But isn’t trying to force a change in an individual’s natural style of play fraught with risk? JS: There is such a misconception about how I want my players to play! I will just say that the batsmen are instructed to think of every ball as an opportunity to hit a 4 or a 6, but if the ball is too good and the risk or percentage for success is not good, then we must do something else. The game is about making runs and I encourage my players to look to score at every opportunity. Our supporters cannot have a team that entertains from ball one by hitting the ball in the air, and expect them to also score a lot of runs at international level. It won’t happen; we will lose wickets and fail 9 times out of ten. Just as we have done in the past. There needs to be a balance of responsibility and structure to our batting. We used to be a team that passed 200 in our innings just 1 time in 4 at the crease. We now do this every second time we play. I look for success in lots of ways, winning is a result of a lot of successes in the process. BC: How is coaching Bangladesh different from coaching Australia or any other international team? JS: In Australia there is an amazing domestic infrastructure which culminates in the best first class competition in the world. The international players, when not playing for the country, simply go back to their state cricket system and train with their state team mates and coaches, fitness trainers, physios, doctors, and so on. In Bangladesh, our players must stay in Dhaka to train and get any coaching they need. There are just no real facilities for them in the home areas, but the Cricket Board and I have identified this and are planning to improve in this area. Our players are just so inexperienced in terms of decision making and being ready for international standard. With Australia you are talking tactics and teaching new shots and small aspects of the game, with our team you spend every day just teaching them the basics of the game, things that they should know when they are 15 or 16. This is because our infrastructure and pathway is not good enough at present. BC: What are the major obstacles that are holding Bangladesh back in international cricket? JS: International cricket is as competitive as it has ever been at the moment. We have seen India beat Australia in Australia in a One Day series, then Pakistan has won the Tri Series in Bangladesh, this was then followed by Sri Lanka beating us all to win the Asia Cup in Pakistan. So all three of these teams are at the top of their games and are capable of pushing the world number one. We are still a young cricket country and are still to get our facilities and infrastructure to where it needs to be to produce world class success stories. We are aware of our deficiencies in this area and know that it will take time to develop them to the high standard required. At the moment the players selected have still got many areas that need to be improved in order to perform consistently at the highest level. The pathway at present does not allow them to be ironed out before they are selected. Our players must learn the hard way, in the public eye, on the international stage. I know we have won games at times in the past, but I ask, have we really produced a world class cricketer that we can rely on year in year out? BC: The standard of domestic cricket is possibly the weakest link in the development cycle of Bangladesh cricket. As one of the most successful first class cricketer of Australia, have you proposed any change in the current system to raise the standard? JS: There is potential in our domestic structure, but quite simply there are not enough quality facilities, including grounds, for our players to train and improve their cricket. For instance I believe there are just 1 or 2 working bowling machines in all of Bangladesh at the moment. I look at the cricket Academy in Australia and they have 5 bowling machines of their own. So for me it is the facilities and infrastructure that we must deal with first, then the standard may have a chance to improve! I know that improving facilities and creating a great infrastructure for our cricket is a massive and expensive task, but we are on the world stage and hope to be there a long time, so we need to get the foundations for success solidly built, or as happens with buildings, the house will keep falling down! The Cricket Board and myself are working closely to identify some of the areas that must be addressed urgently. We have purchased 3 more bowling machines in Australia on our last tour, which is a great start! BC: Recently Bangladesh has shown signs of improvement in batting, but bowling has deteriorated significantly. Do you feel the need for a specialist bowling coach like Ramanayeke in your coaching staff? JS: It is fantastic to have Ramanayeke in our system at the moment and he was a regular at our training before the Australian tour, so we have access to his assistance when we need or want him, his bowling squad regularly attends our training as well. I have a bowling coach who was in place before I came to Bangladesh, his position like all of us, is reviewed regularly, and if we see no sign of improvement, then I am sure changes will be made. Jamie Siddons and Mohammad Ashraful during a press conf. on August 21, 2008. BC: There is a wider perception among cricket fans and media that you are downplaying the successes achieved by your predecessor Dave Whatmore to cover up the recent failures of Bangladesh team. What is your take on this? JS: I have the utmost respect for Dav, he is a personal friend and we speak from time to time. Success is measured in many ways, and I would love the team to grab a couple of wins here and there as Dav and the boys did in his time. However I am not here to have a team win a game or two. I am trying to develop this squad and the future of Bangladesh cricket to a point where they can compete regularly against the top ranked team. This will take time as the players have so many lessons to learn, and skills to develop. There are no easy wins out there at the moment, all the teams we have played recently are very strong and on the move forward. I continually talk about success and improvement, we have a young team and when you are developing you must base success on achievement, not on win/loss. I hate the word failure when used to describe our team. They have had so many achievements in the 9 months I have been with them. It is long term that the people of Bangladesh must look and not for the immediate high of a win, though I admit it would be nice at the moment to get you guys of our backs and to increase the confidence of all. We now have more potential world class players than ever before, and the future is as bright as ever. BC: There was a belief that Bangladesh can compete with any team at their day which appears a distant truth now. Do you think you are a bit too pessimistic about Bangladesh’s chance of winning against the top eight teams which is affecting the team morale? JS: The problem is people have no idea how I talk to my team on a daily basis, the players are aware that our vision is to always improve. I am not interested in coaching a team that relies on luck or it being their day. I am concerned with improving skills and confidence in each other, so that we believe in ourselves every time we compete. We do believe if we play to the best of our ability then we can win. The other thing I need to say that the team under Dav were given 18 games against the so called minnow teams prior to the world cup, this allowed them to win a lot of games in the lead up and gain some momentum, they then went on to win 2 very big games, in perfect conditions for our style of cricket. In my time so far we have been scheduled to play number 2 in the world in 2 series, and number 1 in the world recently. We also had a series in the very tough to tour New Zealand. We have had just one 3 match series against a minor team, a team that actually beat us at the World Cup. We completely outplayed them and won the series 3-0. There are no easy matches in international cricket. India, Pakistan, and Sri Lanka are all extremely strong teams at the moment, and we have been unable to grab a win against them yet. BC: Are you happy with the progress Bangladesh has made over the last 10 months under your coaching? How can players improve their abilities at Test cricket? JS: As I have said previously there are so many examples of success within our team lately, the elusiveness of winning is not helping the public see this though. We have scored our highest scores ever against India and Pakistan in the last 3 months, we have had 5 players make their 1st or 2nd ODI centuries. We have a 19 year old in Roqibul who has 3 times passed 80 against top teams and is looking to be an international player of the future. To improve a cricketer to be successful at highest level of cricket is unbelievably difficult, the skills and temperament must be achieved from their development, not through practice while in the middle of a Test or one day game. BC: How do you explain Bangladesh’s recent performance in Australia? JS: I can say that the results were very disappointing, and the lessons learnt were hard ones. The players were simply overwhelmed by the world number one team. They know they are better than they showed us in this series, and are determined to gain some credibility back in the near future. We should have won the third match in Darwin, our bowlers and in particular our fielders were superb in keeping Australia to 198 in their 50 overs. We were a little unlucky in the beginning of our tour to lose two opening batsmen before the first practice match, and then to lose Roqibul with a broken thumb in the first ODI. We simply don’t have the depth just yet to replace an opener and our best number four batsman. This left us very unbalanced and even more vulnerable than we were at the beginning. No excuses though, the team has underperformed and are embarrassed by their efforts. BC: In the middle of Australia series you were very critical about Ashraful in public. What were you trying to achieve? JS: I am always talking to Ash about his performances, both good and bad, we are trying to get him to be more consistent and contribute to the score more often. Ash has made maybe just 4 or 5 half centuries in his last 50 innings and I felt it was worth a try to say that we need more from him as captain and a key position batsman in our line-up. Ash was sitting beside me and I only stated the obvious. You might consider it as an honest attempt to make Ashraful aware of his responsibilities. Time will tell if this tactic will work for Ash and the team. I believe we have been too focused on Ash and what he is capable of. We have many batsmen who have made centuries for us and who are real match winners in our team. These are the players that will make us a successful team; one man cannot do it alone. I hope Ash can find the game that he needs to play his role for us. Everyone thinks he is one of our best players. He needs to show this by making consistent big scores. When he does I hope he will be just one of six or seven batsmen in our team who contribute to us making big scores on a regular basis. It has also been said that I tried to remove Ash as captain of the team during our tour. I have never and would never do that to a captain. He has the toughest job in world cricket and his players do not always back him up with consistent performances. I have told him that if he is under too much pressure and he feels his batting is suffering due to captaincy, then he should consider resting from it. A run making Ash is better for his team than to have him as captain and not making runs. BC: What is your expectation from the up-coming New Zealand series? JS: I do not base success on win/loss, as this is demoralizing to a developing side, as they would see every loss as a failure, irrespective of whether they have made a century or taken 5 wickets. And our young team whether we like it or not will lose a few games before they start to win consistently. I want to be realistic here; we have to raise our game to beat teams like New Zealand. The series is on our home soil, the condition should favor us. If we can play up to our potential, there is no reason why we can’t compete and produce some good results. I expect us to have a lot of players achieving great things against New Zealand, and I also believe we will show that we are improving by winning games in this series. Don’t forget though that someone wins and someone loses. We hope to be the ones who achieves more on the day, and come out in front at the end. Winning would be amazing for all of us. BC: Do you think Bangladesh team is a bit too much youth oriented and lacks the guidance of the experienced players? Do you feel senior players like Habibul Bashar can help the young Bangladesh team to approach their game more sensibly? JS: Yes, we lack the experienced player, but you cannot have experienced players in your side who are failing all the time, they will not offer guidance when they are not performing themselves. We have no experienced players out of the team at the moment that demands selection because they are performing, or have performed recently in international cricket. If we had an experienced player who was demanding to be picked because of performances then I would be asking the selectors to pick him. I am sure the selectors have their eyes on them and the results they are getting in domestic cricket. We have no youth policy. Habibul is one of our centrally contracted players. He is not currently in our team but is a helpful and welcome addition at training. He understands better than most just how hard it is to be successful at International level. I would love to have a performing Habibul in our team. However he is not at the top of his game and was omitted some time ago after many opportunities. As I said before, a non-performing senior can’t really influence the game of his team mates. We would not leave a senior player out of our young team if they had the potential to be a match winner or be in our team come the next world cup. Every team plans around the next world cup, and my thoughts are that we should do the same. Siddons talks to Ashraful during Bangladesh vs. South Africa ODI series, March 14, 2008. BC: Where do you want to see Bangladesh at the end of your initial two years contract? JS: We will still be ranked 9th in the world when my 2 years are up as we have been since we started. What I have embarked on is not going to bare much fruit inside 2 years. What I want to see is that we have started to compete and are consistent in the plans and the processes that we need to follow in order to push and beat teams regularly. My intentions have always been to produce some world class performers that can carry the team to new heights on a consistent basis. And the exciting thing is there are 3 or 4 players that may just do that. BC: How long do you want to associate yourself with Bangladesh cricket? JS: It is a big challenge to develop Bangladesh as a competitive cricket nation and I have taken that challenge, I am as enthusiastic as ever. Staying up to 2011 world cup will be my first target. World cup will be a showcase event on our home ground where we will be able to show the extent of our development. We have a very good bunch of young players who have the ability to make their mark on world cricket in 3 years time. I do not know whether Bangladesh will keep me for that long, but I am eagerly looking forward to it. BC: Finally, what will be your message for the Bangladesh cricket fans? JS: My message to the fans is that your team train as hard if not harder than any team in the world at the moment, they are the youngest team in the world at the moment, and as such need the time to grow and learn how to cope with the situations they face in international games. Celebrate the successes of each achievement such as a century by your players. And imagine what we will be like when all these young players can be consistent with this kind of performance on a regular basis. Your team will be exciting to watch and competitive more often than ever. Your coach sees beyond tomorrow and wants long term improvement and success from your players just as much as you do. Continue to support your team now in their development, as you will when they emerge in time as a threat to the game’s best. Look around you, it is not easy to be successful, and it takes time to develop your skills, we need time and your support and patience! Mohammad Ashraful is visiting different primary and secondary schools in Bengali dominated Tower Hamlets borough to promote cricket among expatriot Bangladeshi kids. He volutarily agreed to work as an ambassador of a cricket chariry "Capital Kids Cricket" during his holiday in London . He is counselling parents and encouraging school children to take up cricket as their major sport. He has so far visited 7 state schools in the brorough and met thousands of kids. It is a major boost for the Bangaldeshi community and they thanked Mohammad Ashraful and Capital Kids Cricket for this novel initiative in a program organized at St. Peters College in Whitechapel on Friday. Capital Kids Cricket promotes cricket among different ethnic groups and have achieved tremendous success among British Pakistani and Indian communities. Ravi Bopara who ia now playing for England is one of their major success stories and a good number of their recruits are playing county cricket. This is the first time Capital Kids have taken an extensive program for the expatriot Bangladeshi kids. They have appointed Shahidul Alam Ratan, former Bangladesh U-19 and Malayasia national coach, as the head coach and also appointed 6 other coaches with different level certificates to run the program. Bangladesh’s promise to do better in the next series seems to be never ending. Bangladesh tasted some ODI successes in 2007 but Test cricket remained a mystery to the young Tigers. After a credible performance in the home series against Australia in April 2006, Bangladesh were forced to take a break from Test cricket for 13 months by the administrators of the game. Bangladesh never looked the same team after resuming Test cricket in May 2007 with a home series against India. Much have been said by the Bangladesh think tanks including senior players about the potential damage done by the unwanted break to defend the awful performances and now this should put to a rest. Whatever happened after their resumption of Test cricket, Bangladesh is taking too long to settle in the longer version of the game and time has come to put all the excuses behind and perform like an international outfit. After two poor series against India and Sri Lanka when Bangladesh finally found a coach in Siddons, a change in performance was expected by most of the Bangladesh fans. Bangladesh’s typical roller coaster performance in the New Zealand series, which was his first series with the Tigers, failed to impress the critics for due reasons and the bandwagon against the Test status of Bangladesh is still rife. It can be argued that Siddons didn’t get enough time to make an impact before the New Zealand series which is probably valid, but no such argument can be put forward about the upcoming home series against South Africa. This time Bangladesh have the home advantage, the freedom to make a suitable wicket for them and Siddons had enough time to gauge his boys, and work on their potential strengths and weaknesses. Siddons also claimed that he has found the core players for a future Bangladesh team; as always everything looks promising except the performance. The “talented” labelled Bangladeshi cricketers should realise the importance of consistent performance over once in a blue moon display of “super talents”. It must start from somewhere and after eight years into the Test cricket, it’s better not to prolong the not-so-pleasing wait of the well wishers and cricket followers. South Africa is touring Bangladesh with a full strength team and they will be eager to add another series to their bag before travelling to India. Although their series preparation was badly hampered by the “Quota” row, but the quality of the South African cricket should be enough to overcome such hindrances. Bangladesh need to play exceptionally well to make the uneasiness of the Saffers regarding the issue visible. The series bears a special significance to Bangladesh as it will be the last hurrah for the veteran SLA Mohammad Rafique who was one of the rare Test standard cricketers of Bangladesh. The religious fashion of Bangladesh’s batting failure never offered enough runs to play with, still Rafique produced some exceptional rear guard on numerous occasions with his simple yet venomous spin which are rare fond memories for the Bangladesh fans. He deserves a respectable farewell from his colleagues and there can be nothing better than a good batting total to give Rafique a last chance to exploit the spin weakness of the Saffers. It’s always difficult to write about Bangladesh batting as they always find innovative ways to get out and rare glimpses of performances are always followed by frustration. The slow and low dusty wickets of Bangladesh should suit Bangladeshi style of batting and they have reasonably good batting line-up to post some challenging totals against the pace dominating South African attack. Ntini, Steyn, Morkel all are devastating fast bowlers in friendly conditions but Bangladesh pitches will offer little assistance to their style of bowling. Bangladesh can take heart from the absence of Paul Harris, who recently enjoyed success against Pakistan, and Shaun Pollock who always enjoyed success in the sub-continent. South Africans were once dubbed as the “Bunnies of Spinners”; they have come a long way and recently enjoyed success in the spinner friendly conditions, but still have weaknesses against the quality left arm spins. Bangladesh’s recent triumph against the Saffers in 2007 ODI world cup, which is their solitary success in all forms of the game against the Proteas, in Guyana was scripted by the SLA trio who strangulated them in the middle. Mohammad Rafique and Enamul Haque Jr. duo are able to generate similar asphyxiating feeling in suitable conditions and they will be Bangladesh’s main weapon against the formidable South African batting line-up. If the new ball duo Mashrafe Mortaza and Shahadat Hossain can create some early breakthrough, spinners will be able to utilize the conditions and dominate the play. But first of all the batsmen must score some runs to create a sense of competitiveness. Bangladesh has greater chance to taste success in the ODI series which will follow the Test series, but it’s the Test performance which will come under microscope of the cricket pundits and a good Test series will definitely bolster Bangladesh’s chances to register some ODI wins. Recently every Bangladesh series starts with some promise and ends with some frustration. Bangladesh seems to end up with more questions to answer after some inexplicable displays on the field. Will South Africa series be the beginning of the end of this unpleasant cycle?